Autocheck Vehicle History Report on every car. ^^^^^Sunroof^^^^**Bluetooth Hands Free**, **Balance of Factory Warranty! 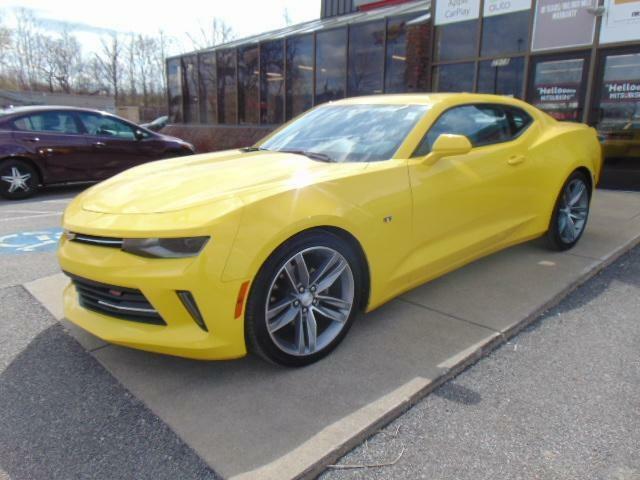 **, **Power Windows** Power locks** Tilt Wheel**Cruise**Automatic**, **Power Sunroof**, Big Sale Weekend Call (330) 722-8000 to confirm availablity, 2 USB Ports & Auxiliary Input Jack, 6-Speaker Audio System Feature, 6-Way Power Front Passenger Seat Adjuster, 8-Way Power Driver Seat Adjuster, ABS brakes, Air Conditioning, AM/FM radio: SiriusXM, Automatic temperature control, Camaro Emblem, Compass, Driver vanity mirror, Electronic Stability Control, Exterior Parking Camera Rear, Front Center Armrest, Front Sport Bucket Seats, Power Sunroof, Power windows, Premium audio system: Chevrolet MyLink, Radio: AM/FM w/Chevrolet MyLink, Rear window defroster, Remote keyless entry, Security system, SiriusXM Satellite Radio, Speed control, Steering wheel mounted audio controls, Tachometer, Telescoping steering wheel, Tilt steering wheel, Trip computer, Voltmeter, Wheels: 20" 5-Split Spoke Machined-Face Aluminum. Sims accepts all trade-ins!!! Antiques accepted. Best values, best experience. Guaranteed! Our goal for 27 years is to provide the best value in quality used cars. Come see how easy we can make it. Can't make it in - we can bring car to you or pick you up. Message: Thought you might be interested in this 2018 Chevrolet Camaro.